FUZZLANTA MUSIC FESTIVAL is a weekend music festival in the inner city of downtown Atlanta, Georgia, and spans various venues and stages. The basis for this festival is the joining and discovering together in great music. I decided that the experience should be a gathering of powerhouses of music from the major genres in music today... Hiphop, Country, Dance, and Rock. The name Fuzzlanta is a combination of inspirations. Relating to both the fuzzy skin of the state's official fruit and the vibrating energy of live music, the word "fuzz" is a simple but effective term to describe the experience of a live music festival in city unofficially named "Hotlanta". The Tiger Head is the face of the Fuzzlanta Music Festival. The concept was developed from the "Fuzz" in Fuzzlanta. Having a tiger with a full force beard is the embodiment of the term "party animal", and this animal inspires the kind of party energy that the jam packed music weekend holds. The four tiger heads representing the four major genres in music today... Hiphop, Country, Dance, and Rock. These tiger heads function as a way-finding system for the various venues and stages in the festival area. Each of the four tiger heads have a flag for their specific genre and are hung out side the venue or stage-area to signify the type of show that is playing there that day. A new technology that has been making its way into music festival culture is Radio Frequency Identification (or RFID) enabled wristbands. These wristbands have a microchip in them to be able to act as an all purpose ticket. The band can be scanned to approve access to different events and areas within the festival. The band also has the ability to be connected to a credit card to go cash-less and card-less to the festival. The Fuzzlanta wristband comes in a standard design with the main color scheme and tiger, as well as special edition designs of the four genre tigers. Branding elements to keep all the venues and stages cohesive with the festival branding. Stage banners and plastic event tape. An interactive souvenir special to Fuzzlanta. Many of the stages and venues throughout the festival are setup for live recording. Because of this the opportunity for festival attendants to take away a personal playlist of their experience is available only at Fuzzlanta. After each day is complete the performances will appear on the FUZZLANTA MIXTAPE app. When these performances appear on the app they can be favorited. Anyone who has the app can then create a "mixtape" of their favorite performances from the festival weekend. The mixtape is then made into a CD and mailed to the festival attendee. What is also special is that the cover artwork for CD sleeve is customizable through the app as well. Users can upload photos and customize festival branding elements such as the Fuzzlanta Tiger or the Fuzzlanta Logotype. This mixtape gives a festival attendants a special gift to take part of the festival experience home with them. The Fuzzlanta Mixtape app is a three part process... Creating your personal tracklist, Customizing your personal artwork, and ordering your personal mixtape. First you look through the list of captured performances throughout the festival weekend and select your favorite performances. Then, you go to the second step and customize your mixtape artwork. You can create a totally original cover using the in app studio or use the explore page to see what artwork other people have made and posted for others to use ( original creator is credited on the back ). 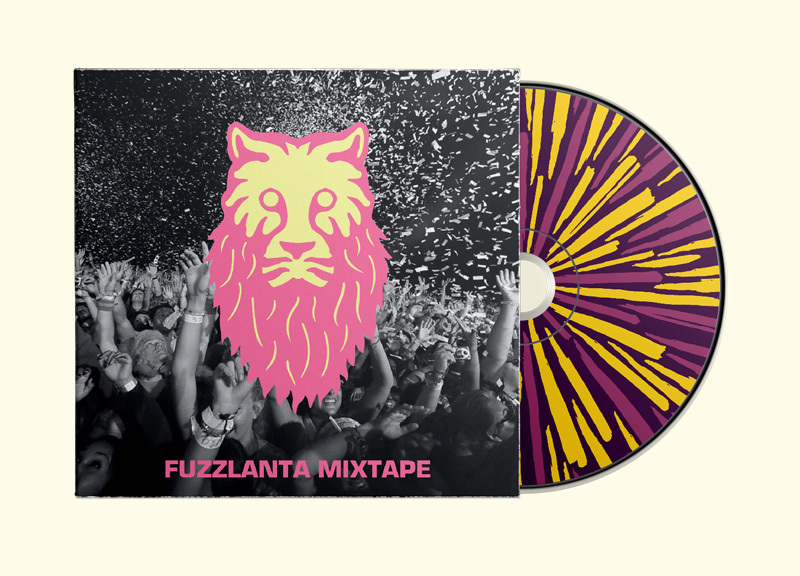 After the artwork is created, all you have to do is put in shipping and billing information and a custom playlist of your time at Fuzzlanta will be on its way.